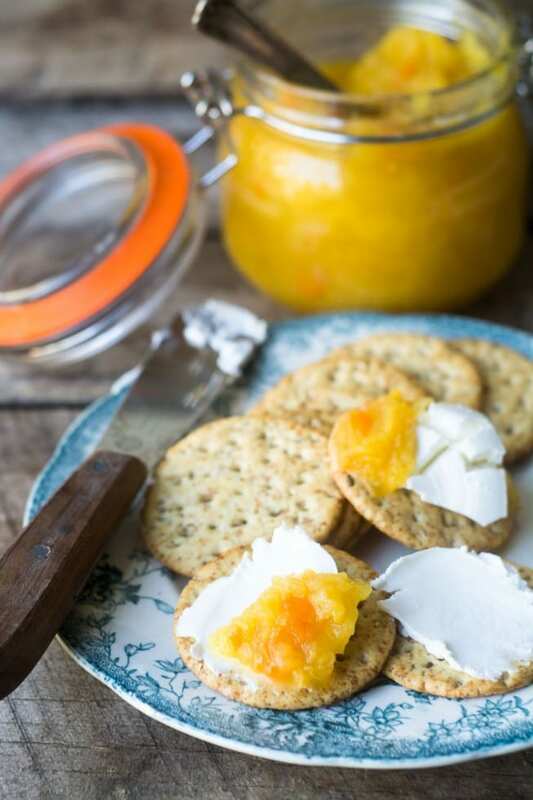 Pineapple Habanero Jam is a delicious no-sugar, no-pectin recipe — the heat and the sweet will duke it out in your mouth, and cheese and crackers will never be the same again. I don’t like to admit how often cheese and crackers figures in our dinner plans. Not as a starter, but as the main course. 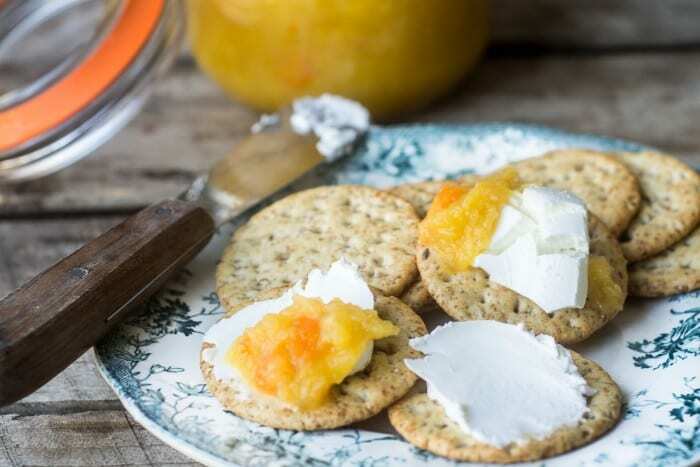 Whatever…I’m sure you have your peculiarities when it comes to dinner, we all do, but I think we can agree that when it comes to cheese and crackers, good condiments are key. 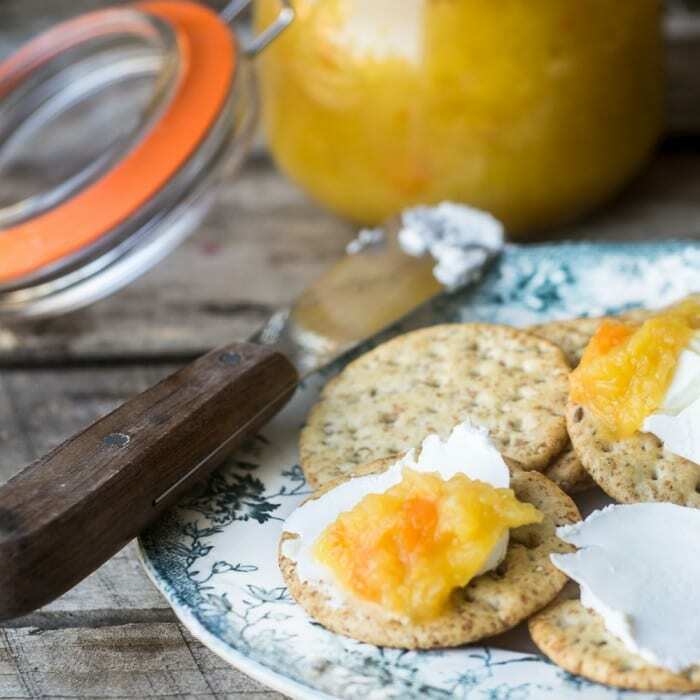 A great hot pepper jam can elevate a water cracker and a schmear of fresh goat cheese to dizzying heights of culinary pleasure. No exaggeration. 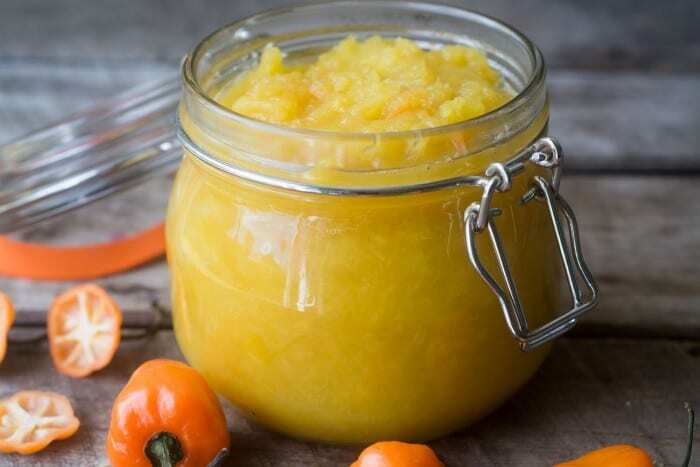 Hot pepper jams and jellies are definitely a polarizing food — people tend to crave them or hate them, but over the years I’ve found that those in the ‘nay’ camp can usually be convinced with just one taste. Personally I’ve never met a spicy jam I didn’t love, unless of course it commits the mortal sin of not being hot enough. 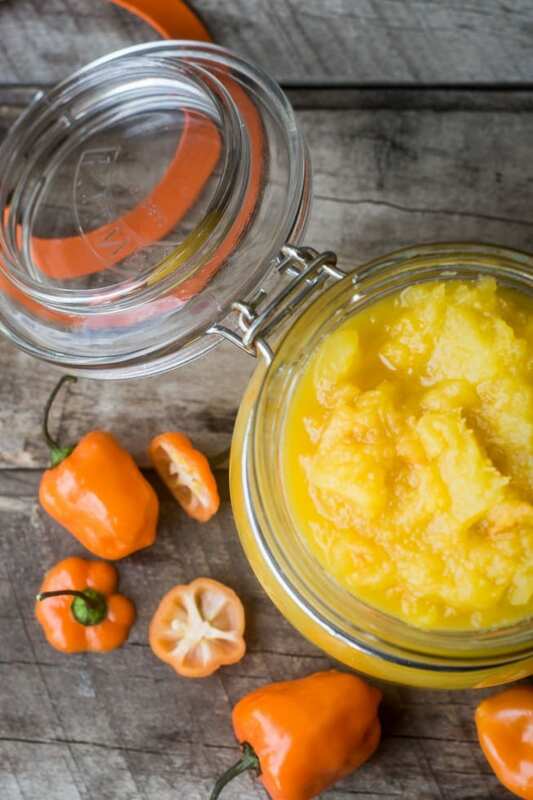 Enter the mighty habanero, the hottest pepper you’ll find in the supermarket. It’s small, bright orange, and packs a wallop. Look for them right next to the jalapenos and the Serranos. While I’ve made lots and lots of hot pepper jams and jellies, I never thought to use pineapple until we found a little jar at a gourmet cheese and wine store while we were visiting in Florida a couple of weeks ago. The one we bought didn’t have nearly enough of a kick for my taste, and it was made with pineapple juice, not the actual fruit — so it just begged for the DIY treatment! My version uses an entire pineapple and three habanero peppers for a good amount of heat. I didn’t add any sugar or pectin., I found the pineapple is both sweet and thick enough on its own. I love the fresh taste and that sunny color! 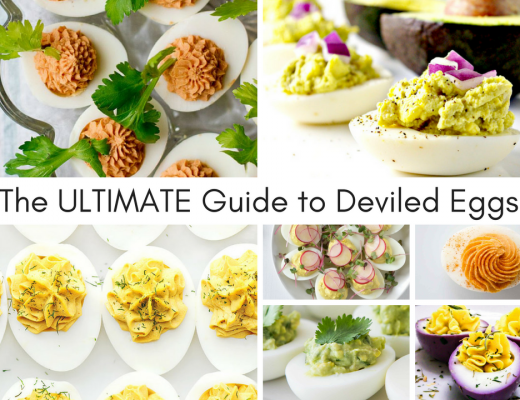 I generally choose a cream cheese or a whipped goat cheese to serve with hot pepper jellies and jams. But I asked the owner of the gourmet shop in Florida what he recommended for the hot pineapple jam and he suggested a good ripe Brie. I’ve tried it both ways and both are fantastic, so take your pick! Don’t stop with cheese and crackers, try this on grilled chicken or pork, or on a turkey sandwich. if you’re into this kind of thing you need to try my other varieties — NECTARINE, CRANBERRY, GRAPEFRUIT, BELL PEPPER and PEACH. Cut the top off the pinapple and then run a sharp knife along the rind to peel it. Slice the pineapple, core and all, and then chop it. Put the pineapple and juice in a pot. Trim the stem end off the habanero pepper(s) and give them a rough chop, and add them to the pot, seeds and all. Bring the pot to a boil, then turn down and boil for about 20 minutes, stirring often, until the pineapple has softened. Use an immersion blender to blend the pineapple mixture. You don't have to get it completely smooth, just be sure to get all of the large chunks blended. Cook another 20 minutes or so, until thickened. Stir often so the jam doesn't scorch. Spoon the jam into a clean jar and let cool to room temperature. Then cap and refrigerate. The jam should keep for at least 10 days in the refrigerator. If you where to can this, how long do you think it would last, one year? Can not wait to try this! This is the first year that I have a garden in Sweden and it is exciting to see how many different jams I can make :) and there is nothing better than cheese and crackers! Hey Crystal, if you want it to last that long I would freeze it. Congrats on your garden! Can I use Jalapeño Peppers instead…plenty from the garden! I am wondering if you could use canned pineapple in place of fresh pineapple? and if so.. how much would you use please? Excellent!! I’ve made this so many times! What would you suggest as an estimate for the pineapple if measured in cups, in stead of a whole pineapple? Maybe 4 cups as a rough estimate, Anna. This sounds like a great flavor combo. I’m going to try it. Would this freeze well? I assume so, I always freeze my extra jams and jellies rather than can them. Hah! You’re the kind of customer I like Adina!! I LOVE making jams and jellies Sue and this one sounds so delicious! Love the sweet and spicing combo! In Germany eating cheese, cold cuts and bread or crackers for dinner in the evening is called Abendbrot ( evening bread) and it is the norm. 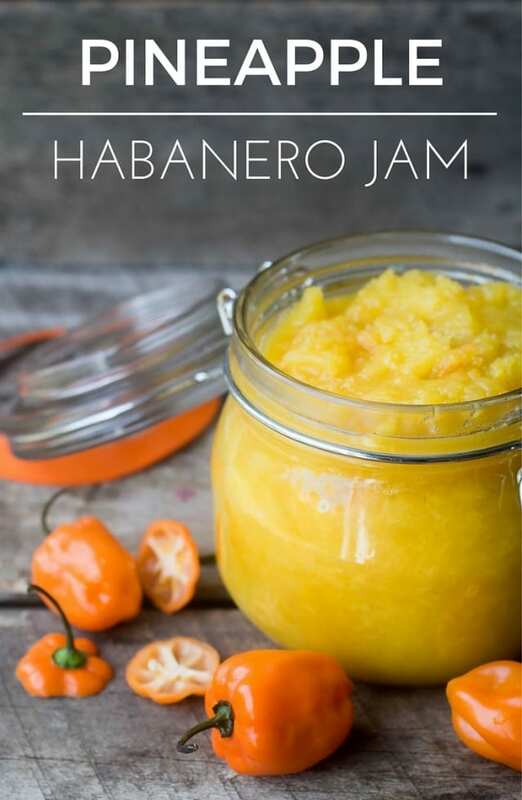 Your habanero pineapple jam would make a great addition. I didn’t know that, thanks Gerlinde – I think it’s probably a healthy way to eat. I love jams like this! They are perfect to have in the fridge for impromptu wine, cheese and cracker occasions :) Loving the pineapple!! I’m totally guilty of serving cheese and crackers for dinner! I couldn’t handle the habanero (because I’m a weenie) but my husband would love him some habanero jam! I think he would put it on everything! I’m totally making this for him! Love that kick from the habanero! I could easily make a meal out of crackers and cheese too ;). I think I could smear this on a grilled cheese sandwich! How beautiful and so creatively wonderful! Sharing! What a great combination! I too love cheese and crackers; sometimes (when I’m feeling lazy) that’s all I’ll have throughout the day. How comforting that there are others making a dinner out of crackers and cheese! Oh, the privilege of being empty-nesters! Will definitely be making this the next time pineapples go on sale. Thanks, Sue! We did the crackers and cheese thing even when my girls were both at home :) We’re dedicated cheese platers here! It is hard to stop at a few crackers with cheese and if the selection included this sweet/hot jam, I’d be quite happy to call it dinner too! It’s a wonderful combination! Oh lordy this looks good. 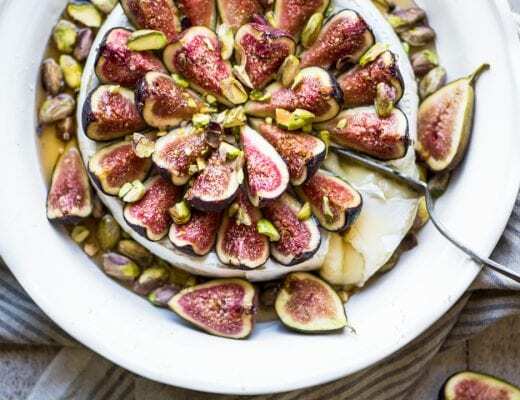 Do you think this would hold up in a spring pan with the goat cheese? 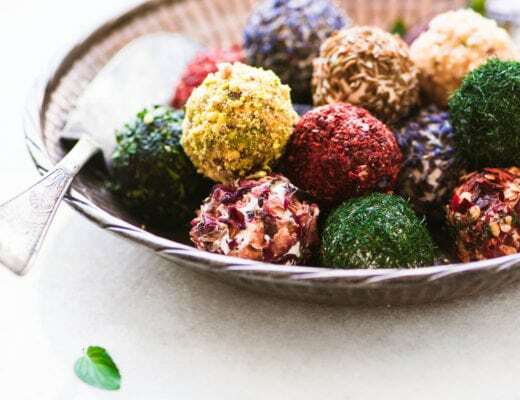 It would make a tasty/colorful appetizer at my daughters wedding. I’m not sure I know what you mean, so it’s hard to say. I think you could use it as a topping for a wheel of say, Brie, for baking. A great way to have pineapple longer :) If it lasts..Love the color.! We eat cheese and crackers for dinner as well and this recipe will ensure we continue to, lol. You and I have such similar tastes in food, Sue, and I’m all about the heat too. I love that there’s no pectin or sugar in it. I’d love it with both goat cheese and brie. Yum!